Al Riyadh Mall is located in Khalid Bin Al Waleed Street, Al Andalus District, Riyadh. Al Riyadh Mall is one of the oldest commercial centers in Riyadh, it includes many local shops, which are characterized by cheap prices and variety of goods. It owns a vital and important location. It offers a total of 420 shops. This mall includes many activities such as gold shops, textiles, dresses, a restaurant complex, a games room and parking for families only. 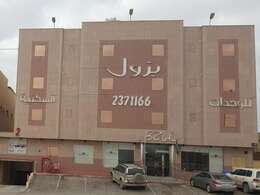 Al Riyadh Mall consists of two floors, the ground floor offers household supplies, women's and men's clothing, children's clothing, baby clothes, baby gifts, and abayas. There are other shops selling gifts, and there is toy shops. Al Riyadh Mall also features Kid Zone, it is a small square in the center of Riyadh Mall, for young children, it is surrounded by shops selling light food and beverages. The second floor is mostly shops for evening dresses, occasions and brides' dresses, with some shops that sell accessories, bags and watches. There is also a small dining hall and chapel for men and women. Al Riyadh Mall operates from 9:00 am to 12:00 pm and from 4:00 am to 11:00 pm.